I made this tonight after doing a little more organizing and working on an unfinished project with which I am not sure what to do. The background fabric is unbleached muslin that I “dyed” using watered down acrylic paint and a lot of scrunching. The text is from a very old hymnal. The rest are studio droppings. This was fun, it’s small, and it fits a photo frame that has just been begging for some art. 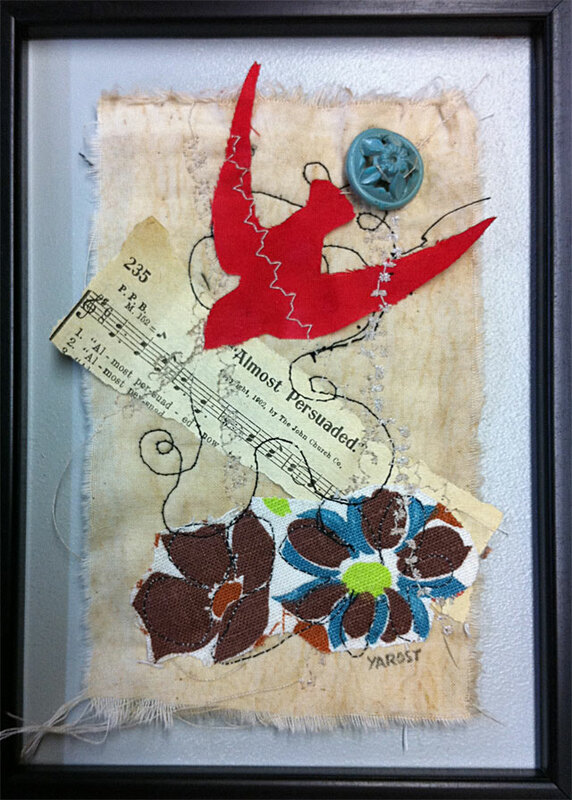 This entry was posted in Art, collage, creativity, Quilting and tagged art, collage, creativity, fabric, mixed media, Muslin, paint, paper, postaday2011, quilt, Quilting, sewing, stashbusting, studio, Studio droppings, Visual Arts. Bookmark the permalink. Hey, this is beautiful, Lisa! You go girl! Thanks, Claudia. I’ve discovered several of these frames while cleaning out the studio, so I plan to produce a series of little pieces to live in them. This is beautiful, Lisa. I really like your work. By the way, I owe you a thank you. You unintentionally helped me deal with a problem I was having with the new thing I am creating. I’m learning from true artists. Thanks, Lisa! I’m having a lot of fun experimenting right now. My blog has helped me to become more productive with my artwork, and the more we make, the more we learn!